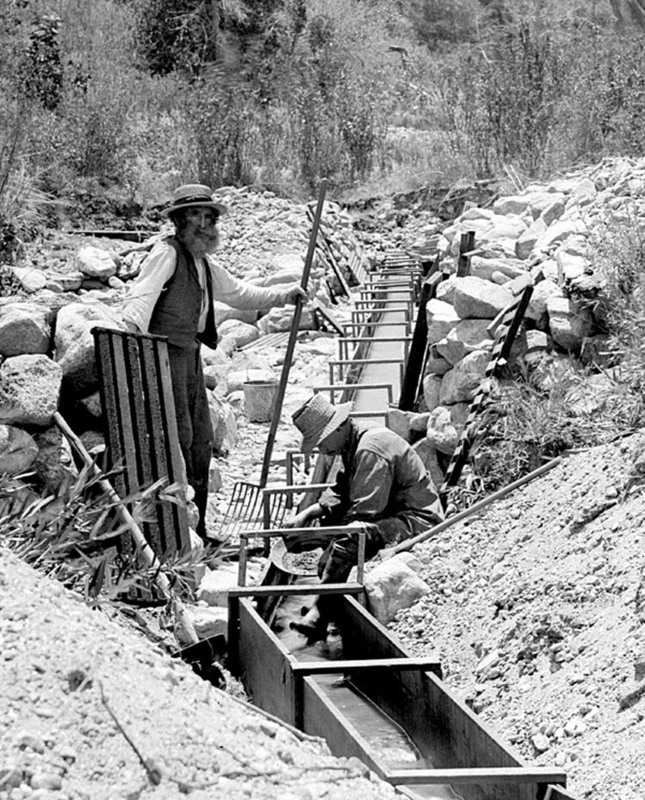 "Cap" Harmon and his gold mining sluice in Placerita Canyon, 1890s-1900s. According to George Starbuck, Harmon is buried in Placerita Canyon with a large boulder as his headstone. Starbuck writes (July 22, 2005): "Cap was a ship's captain at one time and jumped ship out of San Pedro to join the gold rush in Placerita. He's buried up behind the old home site. I know exactly where but I'm reluctant to point it out. ... I have the old pitchfork he's holding, still in good shape." Image from a glass-plate negative by Frank Evans. Hunters Discover Miner Lying Dead in His Cabin. Los Angeles Herald | Wednesday, January 20, 1909. 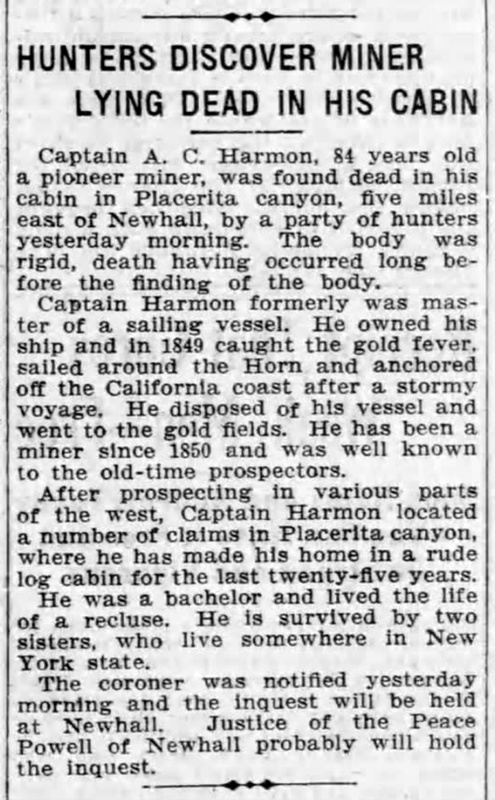 Captain A.C. Harmon, 84 years old a pioneer miner, was found dead in his cabin in Placerita canyon, five miles east of Newhall, by a party of hunters yesterday morning. The body was rigid, death having occurred long before finding the body. Captain Harmon formerly was master of a sailing vessel. He owned his ship and in 1849 caught the gold fever, sailed around the Horn and anchored off the California coast after a stormy voyage. He disposed of his vessel and went to the gold fields. He has been a miner since 1850 and was well known to the old-time prospectors. After prospecting in various parts of the west, Captain Harmon located a number of claims in Placerita canyon, where he has made his home in a rude log cabin for the last twenty-five years. He was a bachelor and lived the life of a recluse. He is survived by two sisters, who live somewhere in New York state. The coroner was notified yesterday morning and the inquest will be held at Newhall. Justice of the Peace [John F.] Powell of Newhall probably will hold the inquest. Newspaper clipping courtesy of Lauren Parker. GS3001b: 2400 dpi jpeg from 600 dpi jpeg.